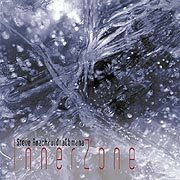 Step into the InnerZone with surrealist soundsculptors Steve Roach and vidnaObmana on there their first new collaborative work since 1999’s quickly sold-out limited edition box set Ascension of Shadows. Venturing off safe and well travelled roads, the duo head into a chilling and beautifully haunting realm of shape-shifting soundscapes mixed with fascinating rhythmic forms. An unusual combination of instruments both acoustic and electronic can be heard on this compelling release. Central is the fujara, a East-European overtone flute, and the electric guitar — both creatively altered with a multitude of audio processing equipment to create a hybrid electro-acoustic mix. The final merging of surreal acoustic, electronic elements and deep “inner” rhythms creates a bold new atmospheric music experience.